Before I start to recount today’s excitements, I must just have a post script on yesterday because in my keenness to recount our disappointment regarding the pub being closed, I omitted to mention the dog memorial! Just as we gained sight of Millington we came across a wooden chair by the side of the road dedicated to the passing of Max and Benson in rather quick succession over the last couple of years. Very sad. 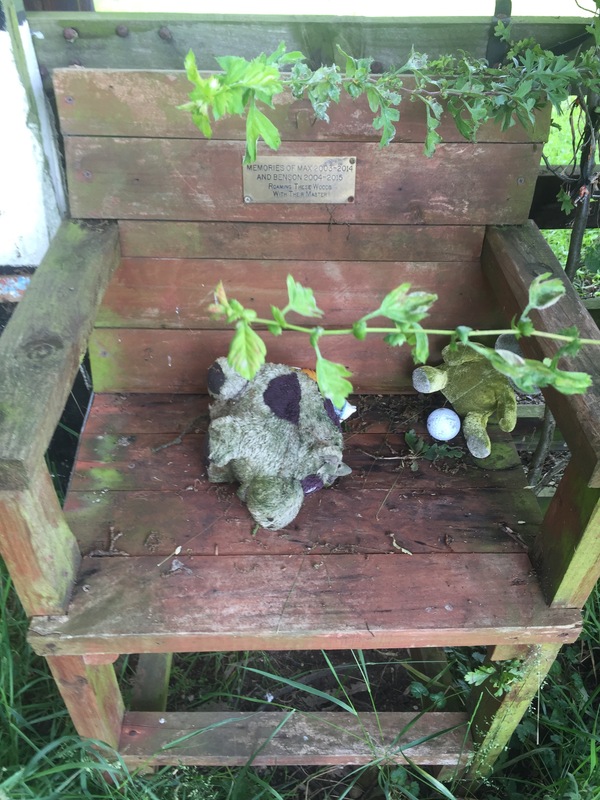 However I feel it a bit over the top that their toys should be left around the chair…… Extraordinary! So back to Laburnam Cottage, Millington, where we had passed the night and from which we watched the heavens open just before we set off to walk the 12 miles to Thixendale. Not a good start. However, loins girded we set off. It was no longer raining but it was a dripping world and very wet underfoot. 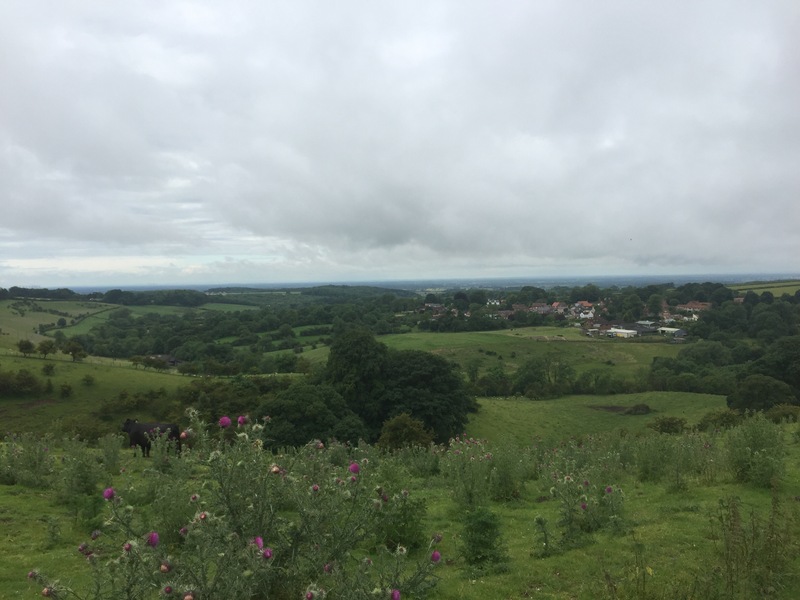 Our route initially followed the Minster Way, another route over the wolds, to get us up onto the Wolds Way as it followed a fence line along the hill above the village. 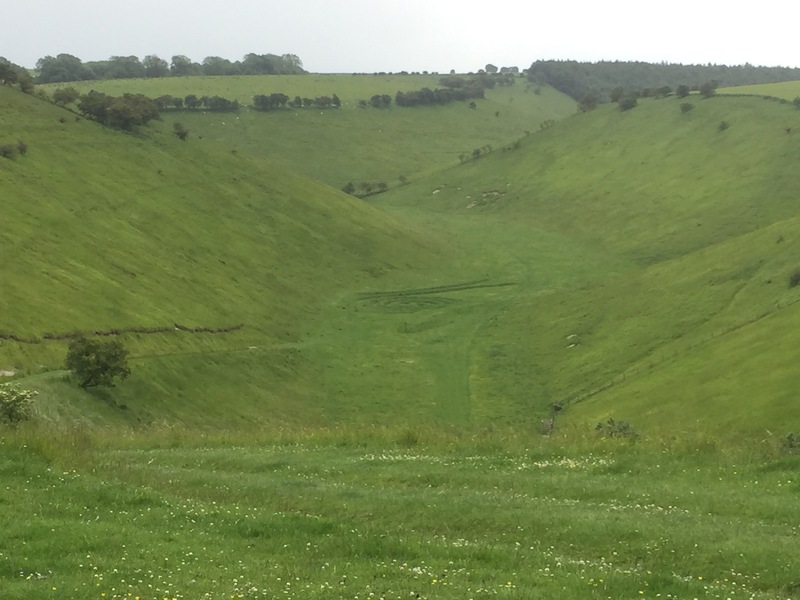 To ease the climb, we followed the chalky farm track that zig zagged up the grassy bank and eventually reached our path as it passed behind Warren Farm. We were back on piste and looked back down on Millington. We then had a straight stretch overlooking Sylvan Dale. It was an area hardly touched by plough or fertiliser. Wild flowers, butterflies and birds were the result. We looked down and then descended into the the valley below. It was then up again, probably the steepest slope of the walk thus far. At the top, we followed a field edge for some time. 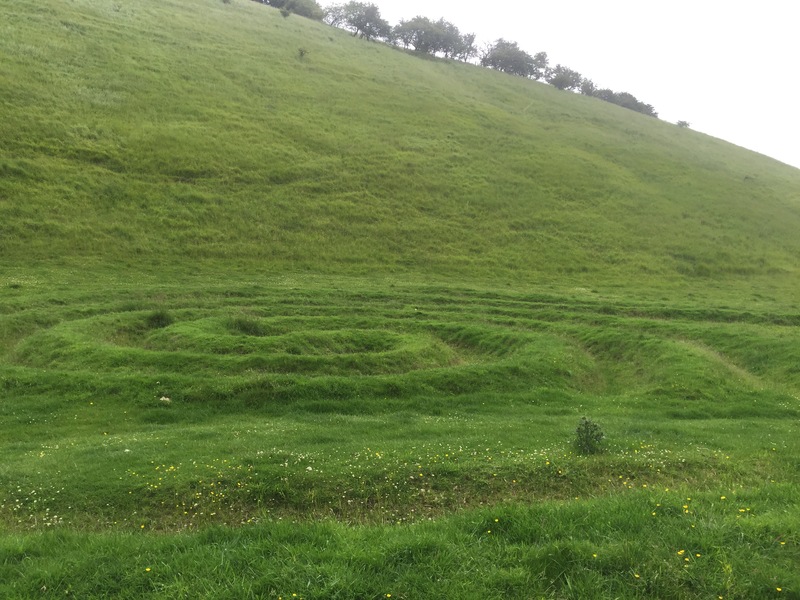 A constant was evidence of Iron Age activity in the major earthworks that ran parallel to the path. We were walking through the landscape of thousands of years ago. What a privilege! We descended again and then took a more gradual path up. The views were amazing. We crossed a road and continued through meadows with the road below. The grass was drenching. We arrived at a cross roads and turned left down the road and headed up passing a sign to Northgate Farm after passing a walking group coming the other way. The views to York Minster and Lincoln Cathedral advertised in the guidebook did not quite materialise as they disappeared in the mist of the horizon. The trees along our path strained in the pressure of the prevailing wind. Before Northgate House we took a turn to the left and were soon at the top of Horse Dale. We walked along the top edge of the valley. Below sheep walked a parallel path along the bottom of the valley. 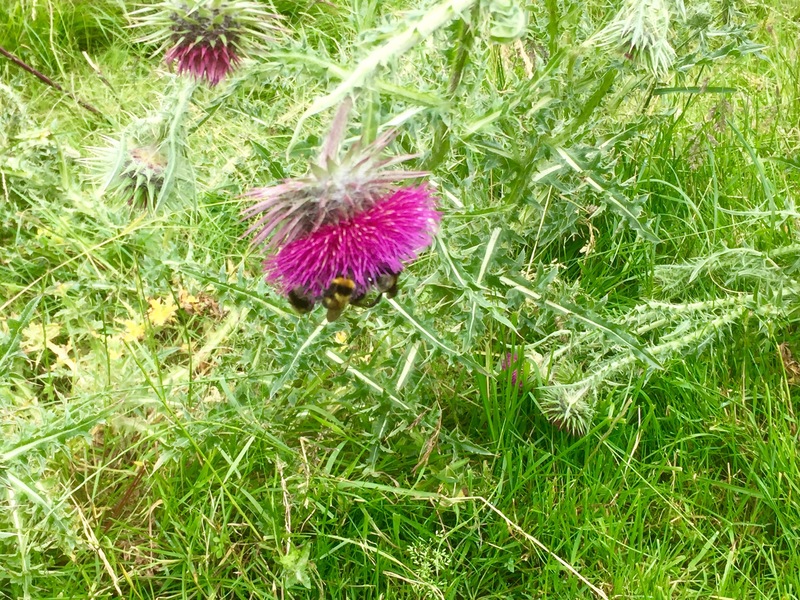 We gradually descended to the end of the valley below and saw thistles bowed down by bees keen to take the nectar of their flowers. There were four or five bees per flower head. It was a long valley bottom as we moved into Holm Dale and continued ahead with steep escarpments on either side. At the end of the Dale we came out onto a track that took us down into the village of Fridaythorpe. Here we took a slightly unusual turn as we abandoned our handful of nuts that constitutes our usual walking lunch and took advantage of the usefully placed Seaways Cafe (the sign included leaping Dolphins slightly unusual in a totally landlocked Wolds village!). This was a bikers cafe if there ever was one, complete with leather clad elderly motorcyclists sipping tea from big mugs outside, their trusty metal steads coralled in rows beside them. It was very exciting although difficult to maintain my ‘ no bread’ stance in the face of everything you could wish for in a sandwich! I survived! Fridaythorpe is about half Way between Hessle and Filey. Back on the road we returned to our sign posts and having passed the designer bus shelter by the pond (part of the Wander – Art on the Wolds Way scheme) and the almost derelict Farmers Arms another sad casualty of the lack of profit in pub management we headed out into the country once more. On the way we passed a huge modern grain mill and set off through several fields in bright sunshine and eventually descended into the jolly named a Brubbers Dale. 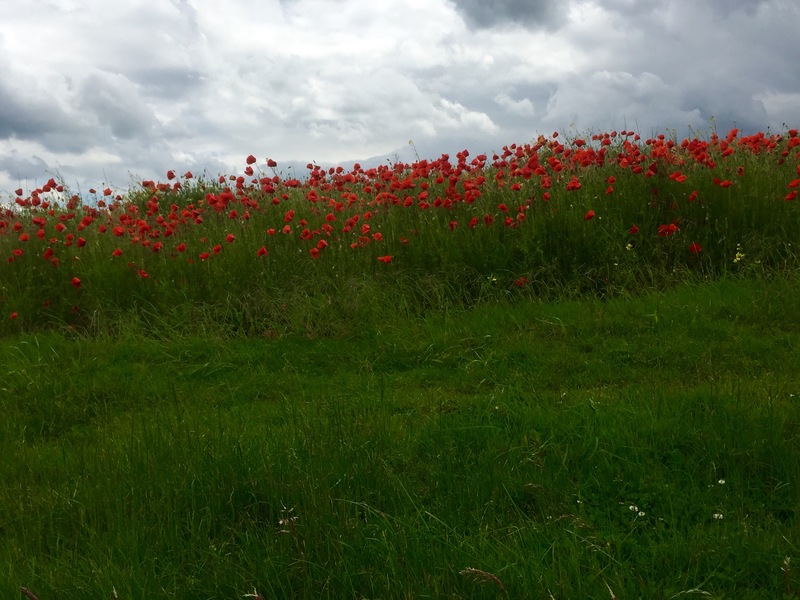 More poppies were a delight…. 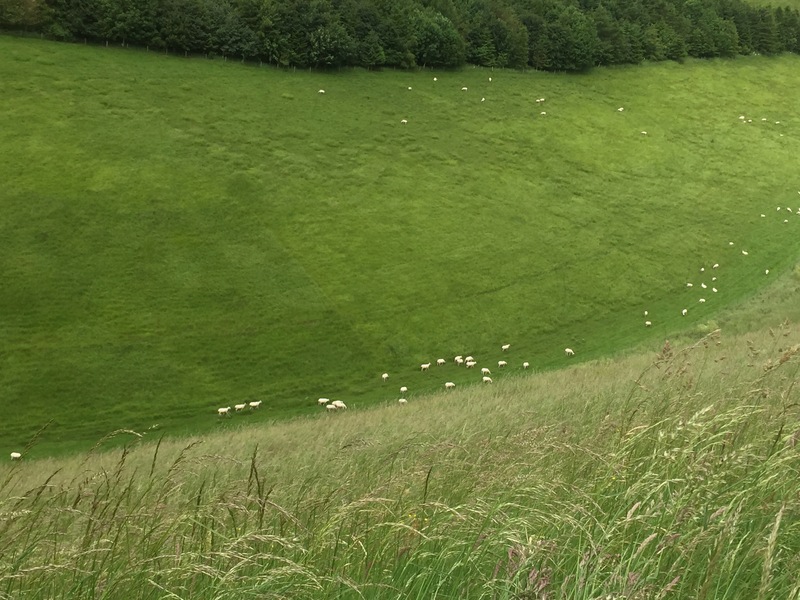 Having passed the art we walked the beautiful Thixen Dale thought to be one of the most enjoyable parts of the route. 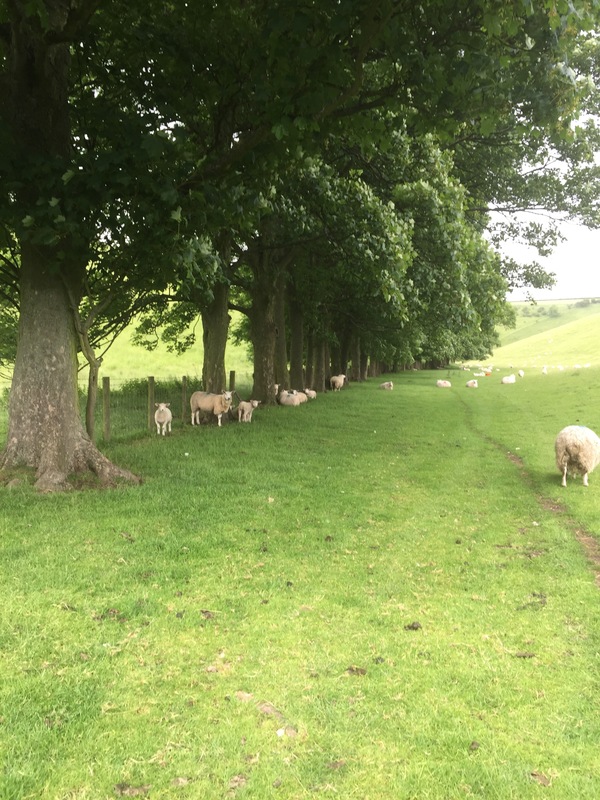 It was lovely and I particularly enjoyed the sight of a single sheep parked beneath the enormous trees along one side of the path. It looked as if they had booked their places! As we neared the Thixendale village we passed a clay pigeon shooting group – the sound of the guns ricocheted off the valley walls. The sheep munched on. Very soon we reached the turning for the village – and almost immediately we were at the Cross Keys pub, our accommodation for the next couple of days.